We have had an explosion of incarceration in the United States in the last 30 years. Minority races, the poor, and least educated continue to be way over represented as inmates statistically. Addiction, and our society’s inability to cope with the plague it represents, contributes to arrests and recidivism, and drug offenses fuel incarceration rates. Young males dominate the populations of our prisons, while female rates explode proportionately but in smaller overall numbers. One in 28 US kids has a parent in prison, and that tells much of the story of where the males are that might be a role model. 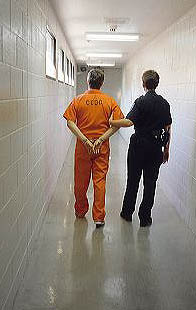 The religious civil rights of Pagans, or any inmate, are now well established in law. Whether the implementation of that law takes place seems to depend on individual states, institutions, and the staff and chaplains who work within them. Officials and inmates can work together to find reasonable accommodation to individual spiritual practice, and equity of accommodation among the many spiritual paths in prison, or we can all bear the cost of resolving these issues through the courts. Inmates pay for their crimes through the loss of their freedom. To expect them to lose the rights our Constitution considers basic human rights is more for our satisfaction and as ‘punishment’ for those who may have caused us pain or harm. How are these decisions about religious civil rights for Pagans in prison made ? The important decisions about what inmates can have or do in their religious practice are made by those that are least qualified and educated to do so. If you are pulled over for speeding it is the police officer who decides if you get a ticket, not a judge, a specialist in the law. If you say, ” I am on my way to minister to inmates”, they might just say, “Have a nice day”, and let you go. That has happened to me! It is the same in the prison system, it is the guards and the chaplains who decide what goes on. When you get to the upper echelon, the Warden or the Department of Corrections, and they get excited, you tend to see draconian measures because they don’t want any headaches. They see things very practically, and the Pagans represent a slippery slope. They had to cave into the Native Americans. They allow outdoor ritual, the sweat lodge, the use of tobacco, now what if the Druids want that too? If you can get three or four guys together and a religious volunteer, you become a legitimate religious group. All of a sudden you may have thirty outdoor rituals a week, with special guards and space requirements. Where is the funding, where are the extra staff? They just don’t want the headache. They want to stop this as best they can.